kinda meh tbh.. it forces a spell oriented deck to run 1cost minions so.. Okay with the new butterfly but otherwise bad. Would be much better with "add a random hunter spell to your hand"
Huh... this card's effect is weird... 1 mana minions... spells... how do they fit together in the same deck. Never underestimate cards that cycle through your deck. I can't say that this is bad. Hunters are always Spingpaws and Lynxes so it shouldn't be a big buildaround. It just depends on what spells that you need. The minion got potential. It just may not be here yet. Maybe some sort of miracle hunter with this card, Springpaw, Halazzi, the Lynx and the new spell damage hunter legendary? Not sure if it will pan out but it sounds interesting. Slightly better than some Epic from RR ... but is this a fair comparison considering how many epics were terrible from that set? I wouldn't count on this card being anything special. But it's worth noting that you can draw most/all spells in your deck just by combining this with Halazzi. Hold on, this could seriously work in a gimmicky OTK list with Vereesa. You can run Toxmonger and Halazzi and a bunch of other one drops with damage and use them as extremely efficient board clears but also a draw engine to get your combo pieces, then just play Vereesa and do the combo on the following turn. I think this might be included as a 1-off in some face hunter decks. I know that the minion is understated and it doesn't fit in an aggressive deck, but if it fetches you spells, you can use them to burn the enemy's face. People have mentioned Vareesa, you can draw SKill Command w/o her and deal 10 damage. 1 mana minions, not spells. You use this with Lynxes, etc. to fetch your face damaging spells. Then use the new legendary Vereesa to burst down your opponent with Arcane Shot, Rapid Shot, Bomb Toss, Kill Command, etc. I see this fitting in a Toxmonger deck. 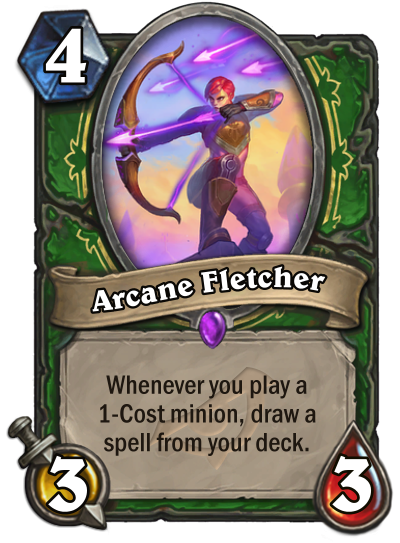 Destroy a minion with Elven Archer and draw a spell from your deck. That could be pretty good. This is interesting. By playing your 1-cost minions you can draw cards that are guaranteed to be spells. Off the top of my head i can't formulate any scenarios in standard, but i think this card may be very strong if built around.